by Elizabeth Roberts; with two images of her art I (+Seraphim Sigrist) have added. The life and achievements of Father Alexander Men have been well documented. For those unfamiliar with his name and works, there are books and internet sites to consult. I was lucky enough to meet him because he baptised my elder daughter Abigail. Abigail had been introduced to Father Alexander by the family with whom she stayed while studying at the Moscow Conservatoire early in 1990. Together with my younger daughter Eloise, in April 1990 I travelled to Father Alexander's little country church at Novaya Derevnya, where we took our place in the queue one Sunday morning after the liturgy to be introduced to him. When our turn came (he was always much in demand), we filed in to his small office in a small wooden building separate from the wooden church, to the left of the entrance to the church precinct. An architect was standing beside him - he was sitting behind his desk with his perennial mug of strong tea at one elbow, showing him the plans of the new baptistry, then in the planning stage(the baptistry has now been built) to accommodate the many candidates for baptism who thronged to Father Alexander. We were introduced by the friends with whom Abi was staying, and the subject turned to her baptismal name. Abi ventured the suggestion that, since that morning he had conducted a funeral service for an elderly parishioner called Agafiya (she had been lying in an open coffin in the church when we arrived - it was possibly the first time either of my daughters had seen a dead person), she might replace the complement of Agafiyas extant. An expression of pleasure and amusement lit up Father Alexander's face: 'Then you would be Agafiya Christi' he said - the British author of detective stories being one of his favourite authors, together with the Father Brown stories by G. K. Chesterton. Later that year, while in Italy he sent a postcard to Abi's Russian host asking that his greetings should be passed on to 'Agafiya Christi'. In the event, Abi took the name of one of her godparents, Alexandra (the real name of the pianist Viktoria Postnikova, wife of the conductor Gennadi Rozhdestvensky). My commitment to keeping the memory of Father Alexander alive and making his work known to an English speaking audience began as soon as possible after his murder (still unsolved) which was carried out, probably by two assailants, early on the morning of September 9th 1990. It is suggested that one of them distracted his attention by asking him to read something which involved him taking out his spectacles from his briefcase; he carried his spectacles in his briefcase and while the spectacles were found on the ground near his hat, the briefcase was never found. The other struck him a professionally-aimed blow on the back of his head, probably with a sappers spade, the sharp instrument used by the Russian (then Soviet) special forces, on the path which winds between trees leading to the station at his home village of Semkhoz, a couple of stops down the line from Novaya Derevnya. Those wishing to see a lovely image of this sad place can visit my 'Russian pilgrimage', featuring photographs taken by my sister in 2001. My latest undertaking is the translation, with additional footnotes for English speaking readers of a collection of letters between Father Alexander and the icon-painter and Russian Orthodox nun, Sister Joanna Reitlinger, published last year 2002 by the Men family foundation under the title Wise Sky (Umnoe Nebo) - the technical term for the background to an icon, as Sister Joanna explains in one of her early letters. The correspondence began in 1975 after they were introduced by mutual friends. Sister Joanna was in her late 70's and Father Alexander was 40. The collection comprises a short introduction to Sister Joanna's life and work, the letters, then a short autobiographical note by Sister Joanna herself and some hitherto unpublished letters to her from her spiritual father Fr. Sergei Bulgakov. The following is my translation of the account of Sister Joanna's life as given in the catalogue of a retrospective exhibition of her work held recently at the Andrei Rublyev Museum in Moscow. The nun Joanna (who always called herself 'Sister') - in the world, Julia Nikolayevna Reitlinger - was born in Petersburg in 1898 and died in Tashkent in 1988. She had lived a long life. The fate of the 'first wave' of emigrants, whose cultural and religious achievement is still not fully known to us or understood by us, was reflected in that life, as in a mirror. J.N. Reitlinger was an outstanding master of 20th century icon painting. But whereas the names of other great icon painters of the Russian diaspora, such as her pupil Father Gregory Kroug, or Leonid Ouspensky, are well known and as respected in the West as they are in Russia, the work of Sister Joanna is known to only a few. Nevertheless, she worked a great deal and fruitfully in France and in England and in Czechoslovakia, especially in the 1930's and 40's. She continued to work when she returned to her native land (if you can call Tashkent her native land), up to the 1970's. Doubts in art are always natural. The exhibition itself refutes the fears of the painter. The living icon world of Sister Joanna is evident to all. The road to icon-painting was simple and direct. The childhood of a child of a noble family in the years before the Revolution, with a nanny, a maid, foreign languages and the gymnasium, and before she finished the 8th class to art school, the Society for the Advancement of Artists; during this time, her grandfather, having dropped the proud prefix 'von' from the surname of the barons Reitlinger and the deep piety of her mother visiting the small domestic church by the museum of Alexander III. Then 'exile': the Crimea, the death of her nearest and dearest, and then Warsaw, Prague, Belgrade, and from 1925 onwards, Paris. In the Crimea in 1918 she made the acquaintance of Fr Sergei Bulgakov, which determined the direction and meaning of the whole of the rest of her life. In Paris, Yu. 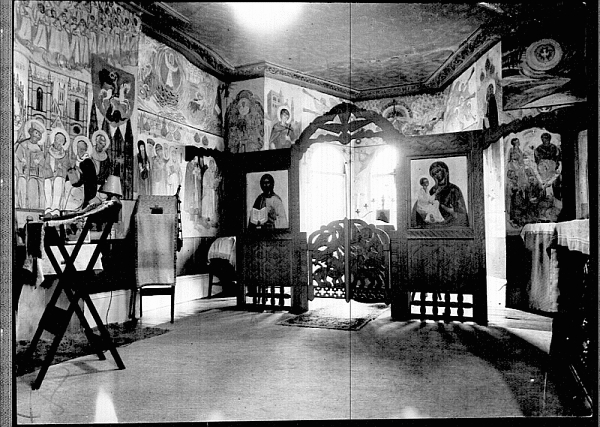 N. Reitlinger settled in the attic of the St Sergius Monastery/institute (church and house) above the rooms of Father Sergei, and was guardian to him and his wife until their deaths in 1944 and 1945. In her autobiography, Yu. N. Reitlinger remembered: 'It was virtually a monastic way of life, meeting Father Sergei, daily attendance at church, but still the world overflowed into it, seductive temptations knocked one off one's feet. Somehow, I had to strengthen my way. A convent - no; my vocation was to be a free artist. The example of Mother Maria (Kuzmina Karavaeva) showed the possibilities: to stay where I was, to take the veil and get on with my painting. Bishop Evlogiy (Metropolitan of the Russian Church Abroad) gave me his blessing. 'But,' he said, 'You are young, mother (the wife of Fr. Sergei) is old. Be a daughter to her; how is she then going to call you 'Matyushka' - that won't do. I will ordain you to the habit, but I'll change your name ... It was the happiest day of my life'. Thus it was that 'Sister' Joanna made her appearance. And, indeed, her art became her most important spiritual achievement. What could Yu. N. Reitlinger see in her childhood and early youth from examples of icon painting, which thereby had such an influence on her spiritual stirrings. We do not know whether she was at two major exhibitions in 1911 and 1913. However, she took certain impressions away with her from Petersburg. In emigration she kept the best publication of those years of old Russian paintings, the 6th volume of the History of Russian Art by Igor Grabar (1914) with wonderful illustrations by P.P Muratov. The question of a renaissance of the tradition of religious art in pre-revolutionary Russia boiled down to a contrast between the living Old Believer tradition and modern art. We know that the technology of Old Believer icons was closely studied by Yu. N. Reitlinger. However, she ruled out going down the path of the purely automatic practice of tracing ('It wasn't my way'). Attempts at reviving the tradition of Old Russian within the branches of the modern style did not suit her either. Evidence of this is her quite harsh comment on the work of D. S. Stelletski (1875-1977) in her autobiographical remarks. Much was learned by the young artist in the workshop of the religious artist, Maurice Denis (1870-1943). An undoubted legacy of his workshop was exercises on composition which are specially noted in the memoirs of Yu. N. Reitlinger. However, here also she explains: 'I went to Denis, although I myself wanted to work in creative icon art whereas Catholic pictures have nothing in common with that'. A fundamental breakthrough in her understanding of the path to 'the creative icon' appeared to be her visit to an exhibition of recently discovered icons from the USSR, which toured many European cities in 1929, including in Germany. According to her memoirs, she spent 5 days at the exhibition and it was one of the most decisive experiences of her life. Along with scientific copies of Andrei Rublyev's Trinity and the Vladimir Mother of God about which Yu. N. Rublyev writes, there were original icons on exhibit including masterpieces from the XII-XV centuries. As a result, her aim became to return icon painting to the realms of 'fine art'. It should be noted that Yu. N. Reitlinger was not the only one to be astounded by this encounter with traditional iconography. Fr Sergei Bulgakov was also deeply affected. It is no accident that soon after, he published a small but, for the future of icon painting, fundamentally important book The Icon and Iconography (1931). Nor were certain lines in this book accidental, clearly they arose in conversation with Yu N Reitlinger who was then living under the same roof, about the canon and accurate (faithful) copies as per the Byzantine masters as a 'living memorial of the church', her 'soborny (communal church fellowship) inspiration', of the essential possibility of the re-establishment of 'new icons with new content' (the life of the Church is never merely quarried out of the old, it has a present and a future and the ever-present movement of the Holy Spirit. And if spiritual visions and discoveries could be depicted in traditional icons, they could be again now and in the future. Whether or not creative inspiration and boldness are evident in a new icon is simply a question of fact.') So in a combination of liturgical life, theology and 'speculation in paints' was born an understanding of the task of giving birth to contemporary Russian Orthodox art. From this time onwards, Yu. N. Reitlinger (Sister Joanna from 1934) worked much and fruitfully. The range of her reference points and images is chronologically wide (lit. 'unrestricted') from the decorative primitives of the XIX (so-called 'icon-measles', such as the series Pages for Children's Reading published under the editorship of Protoierei S. Chetverikov) to early Christian mosaics. These found their reflexion in her lively and picturesque style. A typical comment on an exhibition of icons in Prague, where a contingent of Old Believer apprentices predominated ran: 'lifelessness, stagnation...if it were not for the icons of Reitlinger.' In the 30's and 40's, she painted many icon commissions in France itself and in England (among them only a few are known to the Russian public, and only 4 of which are displayed in the exhibition). Part of the murals for the chapel of St John the Warrior in Meudon has been preserved, saved after a fire and now restored through the initiative of N.A. Struve. The most vivid and powerful scenes are those of the Last Judgement and the Heavenly Liturgy. In general, the problems of the future, knowledge of the triumph of the world (lit: vek = century) to come is the central pre occupation of her work. 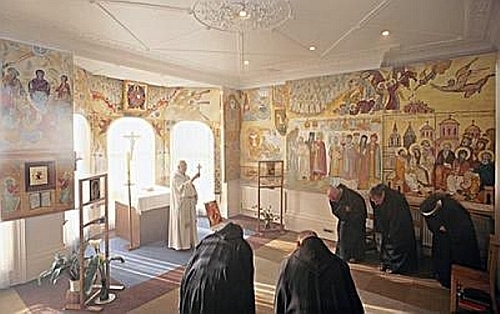 For the House of the Fellowship of St Alban and St Sergius in London, she created a great cycle of the Apocalypse - sharp, expressive, traditional and contemporary (now at the Monastery of Christ the Saviour in Hove, an Anglican brotherhood known as the Community of the Servants of the Will of God. As is well known, Russian culture of the 20th century is intimately linked with an apocalyptic consciousness. There is not a single theologian who has not devoted several pages of commentary to the Revelations of St John the Divine. The book about the Apocalypse by Fr. Sergei Bulgakov published in 1948 after his death was one of his best works. The murals of 1947 were a kind of artistic parallel with the theological text. The spiritual link of Sister Joanna with her mentor was not broken. Little by little I am beginning to breathe a forgotten air. The Vedernikovs , books, meetings with wonderful new young people. I return to my Father's House (the Church) , make my Confession and take Communion with Fr. Andrei Sergeenko which I have not done for ages and for 15-20 years I am working on icons more than I have ever done in my life. Eventually my meeting with Fr. Alexander Men' was somehow sent to me by Fr. Sergei. That is my whole biography, nothing remarkable except my remarkable mentors. Father A. Sergeenko (1903-1973) was the incumbent at the church in Meudon, returned to Russia in 1947. Yu. N. could have met Fr A. Men (1935-1990) in the 1960's, but their spiritual meeting took place around 1974. A return to icon painting in the anti=religious 60's and 70's was also an achievement. She painted icons free, sent them by post from Tashkent (often in boxes hidden by sweets) addressed 'by request' and 'as presents'. According to oral reports, her last icon was Walking on the Water (1983), displayed in the exhibition). She died in the severest Russian nun's habit (the skhima), deaf and blind, praying ceaselessly, remembering her nearest and dearest. At this exhibition of the work of Yu. N. Reitlinger, the first ever in Russia, there are represented mainly icons from the 1970's to the beginning of the 1980's, some watercolours and sketches from the 1920's and 30's and preparatory drawings for icons. Like her early work, the late work of Sister Joanna expresses the wide range of her artistic interests, her sympathy for a wide variety of traditions and an unfailing honesty of interpretation, also a wonderful mastery of composition and spiritual authenticity in her images. The correspondence between these two outstanding individuals in Russian cultural and religious life of the 20th century is absorbing, lively, and multi-faceted. The themes in their letters include sickness and health including psychological aspects of these; family life; personalities (notably Fr. Sergei Bulgakov); prayer; icons; sin and guilt; and throughout is Father Alexander's reassuring Christian response to all these issues. Father Alexander became a spiritual father for Sister Joanna. But they were also friends; they spoke to each other frankly and on the same intellectual level, despite their 37 year age difference. They derived great mutual benefit from their relationship. They gave each other a great deal - both in the literal exchange of gifts (she sent him icons for his parishioners and he sent her his books) - but also in less tangible ways. They were both isolated in their own different ways, and for different reasons - their correspondence went some way to alleviate their isolation, and any reader will feel consoled by the light which shines through it.